The SM3 monoclonal recognizes the under-glycosylated form of MUC1 and is therefore tumor-specific. Reacts with breast, colon and ovarian cancers. Reacts minimally with normal tissue. Hydrogen fluoride deglycosylated milk mucin. Ovarian, breast or colon carcinoma, normal intestine or colon. IHC-P: FFPE human breast carcinoma ICC-IF: MCF7 cell line. Our Abpromise guarantee covers the use of ab22711 in the following tested applications. Overlay histogram showing MCF7 cells stained with ab22711 (red line). The cells were fixed with 4% formaldehyde (10 min) and then permeabilized with 0.1% PBS-Triton X-100 for 15 min. The cells were then incubated in 1x PBS / 10% normal goat serum to block non-specific protein-protein interactions followed by the antibody (ab22711, 1µg/1x106 cells) for 30 min at 22ºC. The secondary antibody used was Alexa Fluor® 488 goat anti-mouse IgG (H&L) (ab150117) at 1/2000 dilution for 30 min at 22°C. Isotype control antibody (black line) was mouse IgG1 [ICIGG1] (ab170190, 1µg/1x106 cells) used under the same conditions. Acquisition of >5,000 events was performed. This antibody gave a positive signal in MCF7 cells fixed with 80% methanol (5 min)/permeabilized with 0.1% PBS-Triton X-100 for 15 min used under the same conditions. used at a 1/1000 dilution for 1hour at room temperature. Alexa Fluor® 594 WGA was used to label plasma membranes (pseudo-colored red) at a 1/200 dilution for 1hour at room temperature. DAPI was used to stain the cell nuclei (pseudo-colored blue) at a concentration of 1.43µM for 1hour at room temperature. IHC image of MUC1 staining in a formalin fixed, paraffin embedded human breast carcinoma tissue section*, performed on a Leica Bond™ system using the standard protocol F. The section was pre-treated using heat mediated antigen retrieval with sodium citrate buffer (pH6, epitope retrieval solution 1) for 20 mins. The section was then incubated with ab22711, 10 µg/ml, for 15 mins at room temperature and detected using an HRP conjugated compact polymer system. DAB was used as the chromogen. The section was then counterstained with haematoxylin and mounted with DPX. Immunohistochemistry (Formalin/PFA-fixed paraffin-embedded sections) - Anti-MUC1 antibody [SM3] (ab22711)Image courtesy of an anonymous Abreview. 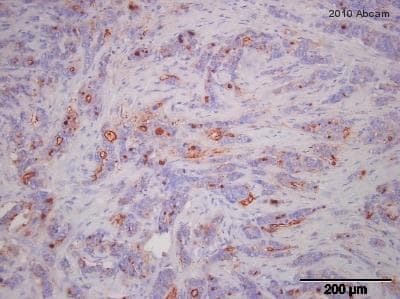 ab22711 staining MUC1 in human breast carcinoma tissue sections by Immunohistochemistry (Formalin/PFA-fixed paraffin-embedded sections). Tissue was fixed with formaldehyde and a heat mediated antigen retrieval step was performed using 10mM citrate buffer. The primary antibody was used undiluted for 18 hours at 4°C. An undiluted HRP-conjugated goat anti-mouse IgG polyclonal was used as secondary antibody. Publishing research using ab22711? Please let us know so that we can cite the reference in this datasheet. I would like to know if the light chain typefor these antibodies has been determined? I am sorry it is taking so long to reply to your enquiry. I am having trouble getting a response from the supplying lab. I will forward you any information I receive as soon as possible but as of now I do not know when I will have further details. Our Anti-MUC1 antibody [SM3] AB22711 has not to our knowledge been tested in Western blot so we do not have specific data regarding the molecular weight of the band that it may reveal in that application. The predicted MW of MUC1 before any post translational modifications is ˜122kDa. An antibody contains 2 heavy and 2 light chains. Each heavy chain will have a molecular weight ˜50kDA while each light chain will have a ˜25kDa MW. In a gel in IP, the reduced antibody will have bands at these sizes while a native (non-reduced) input will weigh ˜150kDA. Again, this product has not been tested in IP and therefore cannot be covered by our Abpromise in this application. We do offer a number of MUC1 antibodies which have been validated in Western Blot or Immunoprecipitation. Anti-MUC1 antibody [115D8] (https://www.abcam.com/MUC1-antibody-115D8-ab36690.html) and Anti-MUC1 antibody [EP1024Y] AB45167 (https://www.abcam.com/MUC1-antibody-EP1024Y-ab45167.html) have both been validated in those applications and are guaranteed to work when used with human tissues. Regarding your other questions about AB2271, this product is shipped at 100ug with a concentration of 1.48mg/ml therefore each vial will contain ˜68ul. This is provided in PBS with no further stabilizes or azide. I can confirm that any publications that we are aware of will be listed on the datasheets. We have a dedicated team who spend time reviewing the literature to find articles that have used our products. I understand you concerns, it is unfortunate that we are not always able to provide these. However, in some cases, regrettably we do not have access to all the articles mentioning our products, or subscriptions to the journals that publish them. If there are any particular antibodies you would like some more information on, I would be pleased to investigate further with our sources in case there are some more publications to provide. In this case, I would appreciate if you would like to provide the product numbers and I can look into this for you. Could you please specify regarding the methods used to raise and clean antibodies ab86182, ab22711? Were both antibodies cultivated in Mice ascite liquid and Protein G purified? Sorry for the late reply. This antibody was produced via tissue culture before purification via protein G. I hope this is helpful. Please contact me again if you have any further questions. The listed uses of SM3 (ab22711) are in immunohistochemistry, however there is published data using this antibody in western blots. Has this antibody been "protected" in any was that a western blot could not be done with this antibody? In addition There are publications with this antibody in ELISA, is there any reason why your antibody would differ to the uses available of the antibody in published data? Thank you for your enquiry. To our knowledge, this antibody has yet to be tested for application in WB or ELISA. It was characterized for use in IHC, but to our knowledge hasn't been altered in any way such that it would not work in WB or ELISA. It's just never been tested. If you decide to go ahead and purchase this product, please let us know how you get on by submitting an Abreview and in return we will award you 50 Abcam Points, which can be redeemed on a number of rewards (a further 100 Abcam Points will be offered for an image). Please contact us again if you have any additional questions. I found out that you sell a large number of antibodies against the human cell surface antigen MUC1. Does any of the ones you sell react with the extracellular domain further out than the cleavage site (or with the cleavage site)? Also, do they react with the mature form (several of the muc1 abs only react with low glycosylated precursors)? And thirdly, do they react with rhesus monkey MUC1? Thank you for your enquiry regarding our MUC1 antibodies. There is indeed a large selection of those antibodies available in our catalogue and I have summarised below the information we have regarding the epitope recognised and whether we know if the antibody recognises various glycosylated forms of the protein. The extracellular part of the human protein is located with aa24-1158. Many antibodies recognize The APDTR repeat found in this region as you will see below. None of those antibodies have been tested against Macaca mulatta tissue, and a homology search showed 78% homology between the human protein and the monkey protein which may be low for using monoclonal antibodies. Ab8323- Binds with high efficiency to epitope within the VNTR tandem repeat peptide region of MUC1 molecule. Recognizes underglycosylated and natural MUC1 protein. Ab696. epitope not mapped. This antibody is specific to 300 kD DF3 antigen. Ab14690. Immunogen sequence is unknown (the antibody is not made by Abcam and kept confidential from us). It is a “60 aa long synthetic peptide representing a 20 amino acid repeat sequence from mucin 1". The antibody labels underglycosylated mucin. 15481. Immunogen sequence is unknown (the antibody is not made by Abcam and kept confidential from us). We know the immunogen is from the cytoplasmic tail part of the protein. Type of underglycosylated or mature protein recognized: unknown. Ab8665: It recognizes the multiple protein epitope that is relatively insensitive to glycosylation. Therefore, it is very sensitive in the detection of episialin expression in different epithelial tissues. Multiple epitopes. Ab22711. SM3 antibody recognises the under-glycosylated form of MUC1. Epitope not mapped. Ab8605. epitope not mapped. Type of underglycosylated or mature protein recognized: unknown. Ab8618. The dominant epitope of this antibody is the 5-mer PDTRP of MUC1 tandem repeat as established with “epitope fingerprinting.” Type of underglycosylated or mature protein recognized: unknown. Ab8606: The dominant epitope of this antibody is the 12-mer GVTSAPDTRPAP of the MUC1 tandem repeat as established with “epitope fingerprinting”. Type of underglycosylated or mature protein recognized: unknown. Ab8608. The dominant epitope of this antibody is the 7mer TSAPDTR of the MUC1 tandem repeat as established with epitope fingerprinting. Type of underglycosylated or mature protein recognized: unknown. Ab8607: The dominant epitope of this antibody is APDTR as established with “epitope fingerprinting.” Type of underglycosylated or mature protein recognized: unknown. Ab8322, ab10115, ab22754, ab22751. Mabs bind with high efficiency with different regions of VTSAPDTRPAPGSTAPPAHGVTSA synthetic peptide spanning the one repeat of VNTR extracellular portion of MUC1 molecule. They react with VNTR5 and VNTR20 recombinant unglycosylated fragments of MUC1 protein and underglycosylated MUC1 prepared from tumor fluids or as a result of chemical treatment of human milk MUC1. These Mabs do not recognize natural MUC1 protein isolated from human milk by affinity purification on carbohydrate epitope specific Mabs. Ab10118, ab10119 Mabs bind with high efficiency with different epitopes within the VNTR tandem repeat peptide region of MUC1 molecule, which have different conformations and peptide- carbohydrate compositions. Ab efficiently recognize underglycosylated and natural MUC1 protein isolated from human milk by affinity chromatography. Ab10120. Mabs bind with high efficiency with different epitopes within the VNTR tandem repeat peptide region of MUC1 molecule, which have different conformations and peptide- carbohydrate compositions. Mab M4H2 reacts with VNTR20 recombinant unglycosylated fragment of MUC1 protein (and very weakly with monomeric MUC1 peptide), with deglycosylated and underglycosylated natural MUC1 (but not with completely glycosylated natural milk MUC1). Ab10124. epitope: peptide repeat RPAP region. Type of underglycosylated or mature protein recognized: unknown. Ab10114. epitope: Peptide tandem repeat in MUC1 core. Type of underglycosylated or mature protein recognized: unknown. Ab6261, ab853. EPitope: unknow. This antibody reacts with an antigen of 265-400 kD belonging to a heterogeneous group of heavily glycosylated proteins called human milk fat globule proteins. I hope this information helps, please do not hesitate to contact us if you need any more advice or information to help you choose the correct antibody suitable for your needs.